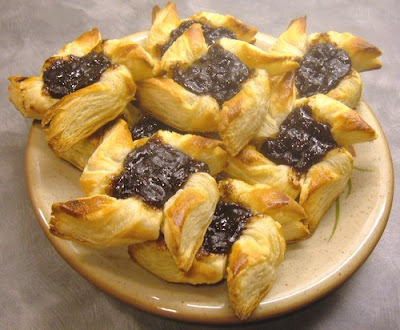 The most traditional Christmas finnish sweet is the "Joulutorttu", aka Christmas tart. It's an essential piece of the Xmas menu, along with the ham and the cassaroles. Roll the pastry out until it's about 0,5 cm thick. Cut it into squares about 10 x 10 cm size. Make 2-3 cm cuts in the middle of each corner. Fold the edges towards the center of the tart and press down gently to hold them together. Beat the egg in a bowl with fork until yolk and white are well mixed and brush it over the pastries. Drop some jam in middle of the tarts. Bake in 225°C pre-heated oven for about 15 minutes or until they get a nice golden color. Sprinkle sugar on top if you like.